EAST RUTHERFORD -- Randy Bullock kicked a 31-yard field goal on the first possession of overtime to give the Jets a stunning 23-20 win Sunday that sent the reeling Giants to their third straight loss. The Jets (7-5) didn't seal the win until Josh Brown missed a 48-yard field goal field goal with 6:33 left in the extra session, his first miss in 26 attempts this season. That left many questioning Giants coach Tom Coughlin's play calling. Coughlin elected to go on a fourth-and-2 from the Jets 4 with his team ahead 20-10 with under nine minutes to play. The play failed. 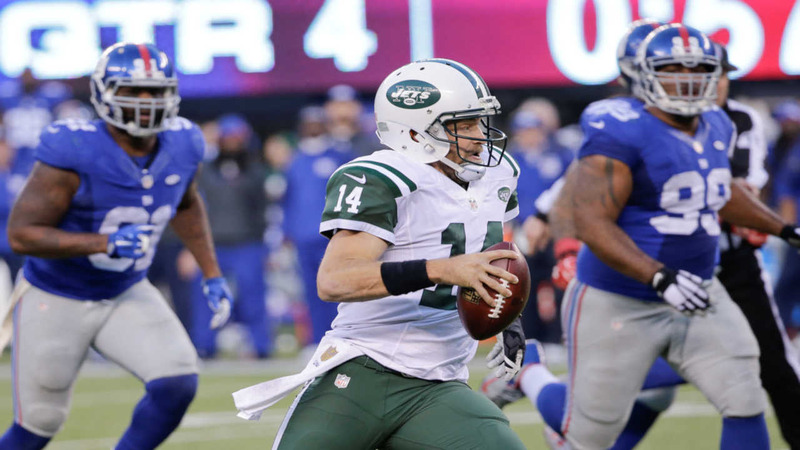 Ryan Fitzpatrick rallied the Jets from a 10-point deficit in the final 4:24 of regulation. Fitzpatrick hit Brandon Marshall for a 9-yard touchdown with 27 seconds remaining to tie it and went 36 for 50 for 390 yards.